The Europa Explorer would use gravity-assist flybys of both Venus and Earth, and thus would be able to deliver about three times the payload mass to the Jupiter system of previous concepts like Europa Orbiter. Jupiter'smoon Europa was revealed by the Galileo spacecraft, and previous missions, tobe a fascinating ice-covered world with some of the best prospects for thepresence of liquid water beyond Earth. Results from various instruments on theGalileo spacecraft revealed the presence of a surface layer approximately 100 km thick with the density ofwater or water ice. These results also suggest that while the top 10 km or soare likely frozen solid, the majority of this water could exist in a liquidform beneath an icy crust. Coupled with the likely presence of the chemicalbuilding blocks of life, and a variety of possible energy sources ranging fromtidal heating from Jupiter's gravity to radiative processing of the surface,Europa has emerged as one of the top Solar System locations in terms ofpotential habitability. Habitability is the focus of the recently released 2006 SolarSystem Exploration Roadmap for NASA's Science Mission Directorate. As stated inthe Roadmap, "A unifying theme for theexploration of our Solar System is habitability -- the ability of worlds tosupport life. As living, self-aware, sentient entities, we seek to know whetherlife is or was present elsewhere in our planetary backyard, how we and ourplanet came to be, and what are the future prospects for terrestrial life onand off the Earth." Highlighting theimportance of this exploration focus, the roadmap states "The Solar SystemExploration program described here directly addresses the key science questionsregarding habitability in the universe." Whilethere are many uncertainties regarding the geology and chemistry of thisenvironment and potential life-supporting energy sources within it,confirmation of the existence and determination of the characteristics ofEuropa's ocean would allow us to conclude whether it is or ever has been ahabitable environment. A positive finding would provide tremendous impetus forfuture surface and subsurface chemical and geophysical Europa exploration. BothGanymede and Callisto also show evidence for subsurface oceans similar to thatof Europa. If the formation of oceans is found to be a common phenomenon, theimplications for life in the cosmos could be stunning. Comparative intensivestudies of Callisto, Ganymede, and Europa could therefore prove to be one ofthe most important contributions we can make to the understanding ofhabitability in the Solar System. The Roadmap describes a Europa Explorer missionconcept. This spacecraft would use gravity-assist flybys of both Venus andEarth, and thus would be able to deliver about three times the payload mass tothe Jupiter system of previous concepts like Europa Orbiter. Technologycurrently exists to allow this mission to survive in the high-radiationenvironment around Europa, and the mission would be able to carry out a minimum90-day nominal mission that could be extended for up to a year depending onspacecraft conditions. Before the spacecraft entered Europa orbit, scientistswould also be able to take great advantage of the two-year period in Jupiterorbit while the spacecraft used multiple flybys of the icy Galilean satellitesto position itself to enter orbit around Europa. The distance and complexity of a mission toorbit Europa means that it truly requires the large Flagship class of missionsas described in the Roadmap. 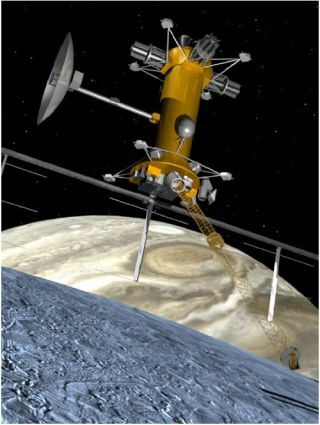 Flyby missions, such as the upcoming New Horizonsmission to Pluto, are possible in the cost-capped New Frontiers mission class,but the complex and versatile multi-function missions that would be necessaryto perform a detailed analysis of Europa require the commitment of people andresources of a Flagship-class mission. NASA's previous Flagship-style missions,such as Voyager, Viking, Magellan, Galileo, and Cassini, have returned or arereturning huge amounts of data and have made fundamental discoveries about thenature of the solar system. The roadmap states: "Large missions capableof reaching distant locations in the outer Solar System with powerfulcomplements of instruments, enabling serendipitous discovery, and conductingadaptive observational programs responsive to these new discoveries is theprovince of Flagship missions. Flagship missions are an essential component ofthe Roadmap, if NASA is to make fundamental new discoveries in the SolarSystem, address the key scientific questions, and maintain public pride andexcitement in America's leadership in deep space exploration." The time is right to begin work on the nextFlagship mission, to Europa. A new start is needed now, providing sufficientdevelopment time to ensure that the mission can be launched in the middle ofthe next decade. Even without an official new start, relatively modestinvestments in refined mission design studies and Europa technology refinementduring the next two years can allow NASA to keep the door open toward a EuropaExplorer launch as soon as future funding permits. The time is right scientifically for a Europamission, as well. Europa science has matured over the last decade, and thecurrent Galileo dataset for Europa has become well characterized. To enable thenext new breakthroughs in understanding the nature of Europa's probable wateryenvironment beneath its icy surface, achieving the high priority science goalsof understanding Europa's potential for life, requires new, more sophisticatedmeasurements that can only come from a dedicated orbiter. The science questionsfor the future exploration of Europa are well defined, and the Europa missionconcept is mature and requires no new technology development. Starting work on a Europa mission now, assuggested by the SolarSystem Exploration Roadmap, is the right thing todo. Europa's interior ocean may be the best environment for life in the solarsystem beyond planet Earth. There is a substantial scientific basis to believethat Europa has the fundamental ingredients necessary for life: water, organicmolecules, a chemical energy source, and a stable environment. UnderstandingEuropa's potential for life brings us closer to addressing one of the mostfundamental scientific questions that humans can ask: Are we alone in thecosmos? It is only by committing the time and resources to a capable Europamission that we will be able to begin to answer this essential question.